If you read the Secure Arkansas website, you’d get the idea that the biggest threats facing Arkansans are fluoridation, vaccines, and an Article V constitutional convention. We can authoritatively determine two things about the writers for Secure Arkansas: they refuse to take accountability for what they say (almost inevitably, they write anonymously), and they have a worldview where facts do not get in the way of conspiracy theories. At issue is SJR 3, legislation that would call “a convention of the states limited to proposing amendments to the United States Constitution that impose fiscal restraints on the federal government, limit the power and jurisdiction of the federal government, and limit the terms of office for its officials and for members of the United States Congress.” Sounds fine, right? If Congress and the president won’t limit government power or stop deficit spending, then it may be time to write such protections into the Constitution. While the organization says that it supports limited government, Secure Arkansas has many problems with this resolution. Some of those objections border on being reasonable. Other objections, however, are straight out of the usual Secure Arkansas playbook – innuendo, questioning the motives of others, completely misunderstanding basic legislation, and a tangled web of conspiracy and guilt by association. The most reasonable objection to an Article V convention is that it will be a “runaway convention” that will propose amendments that undo the Constitution as we know it. Far more rational people than those at Secure Arkansas have raised this same objection. Anyone concerned about these issues should look at this FAQ put out by the Convention of the States organization. Even under the worst case scenario – a constitutional convention proposes a variety of anti-liberty amendments – that does not mean the Constitution would be amended. Anything that emerges from an Article V convention must be ratified by 3/4 of the states. Thirteen states could refuse to ratify any out-of-line amendment that would come from a convention and it would be dead. Of course, Secure Arkansas doesn’t stick with a reasonable discussion of the policy issues posed by an Article V convention. The highlight of its anti-convention push is a blog post that supposedly exposes the tangled web of conspiracies being directed by George Soros. It’s a classic example of guilt by association, unsupported accusations of corruption, irrelevant details, and paranoid fantasies that one expects from conspiracy theorists. Mysteriously, Secure Arkansas does not apply its own “logic” (such that it is) to the anti-Article V convention forces. For instance, Common Cause, a liberal advocacy group, is opposing an Article V convention. Guess who has helped fund Common Cause? George Soros. It appears that Secure Arkansas is working hand-in-hand with groups funded by George Soros in order to defeat this effort. In its Soros-conspiracy blog post, Secure Arkansas asks, “Should it also not bother [Mark] Meckler [founder of a group pushing the Article V convention] that George Soros is also funding these liberal groups and also wants an Article V Convention to take place? Would that not make one a little suspicious of their motives?” By that reasoning, one needs to ask, “Should it also not bother Secure Arkansas that George Soros is also funding these liberal groups that also oppose an Article V Convention? Would that not make one a little suspicious of their motives?” If Secure Arkansas is so paranoid about George Soros, why is it lining up with Soros-funded groups like Common Cause to oppose an Article V convention? Personally, I find the efforts to attack certain ideas because of their association with George Soros absurd. But Secure Arkansas clearly views anything associated with Soros as tainted. Curiously, Secure Arkansas is extremely selective about when it relies on this line of attack. I recognize that expecting Secure Arkansas to act reasonably is probably futile. Anyone with passing familiarity with the group knows that Secure Arkansas has a history of bizarre, uninformed, and illogical stances. We’ve discussed it in the past on TAP. No one should take this group seriously when it comes to public policy or health advice. It is not really necessary to write this blog post. The best rebuttal to what Secure Arkansas writes is actually in the group’s blog posts – they are so outlandish and nonsensical that no one except fellow conspiracy theorists would believe them. In one of TAP’s previous posts about Secure Arkansas, a commenter wrote that he was “Struggling to understand why you bend over backwards to discern any coherency in the statements of a group that considers bicycle paths to be a communist plot.” Perhaps that is a good attitude to take towards this group. Unfortunately, some people do think that Secure Arkansas is a trustworthy source of commentary. 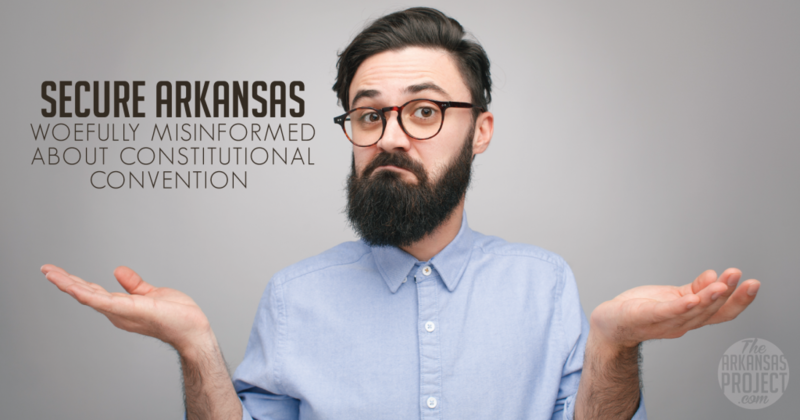 Perhaps they may stumble upon this blog and have the revelation that, indeed, Secure Arkansas’s fevered nightmares about constitutional convention anarchy are not supported by fact.